Another Al Qaeda leader in Iran is Sulaiman Jasim Abu Ghaith. He was Al Qaeda's spokesman until the summer of 2002. According to US sources, this former Kuwaiti citizen is in the custody of the Iranian authorities, but the Iranians have never confirmed his detention. I heard in Baghdad that one son of Osama bin Laden, Saad, is also being allowed to operate from Iran. He is in contact with Al Qaeda fighters hiding in Afghanistan, Pakistan, Saudi Arabia and other Middle Eastern countries. Al Qaeda told its fighters in September 2003 to enter Iraq. I visited Kunar province of Afghanistan that month to meet Al Qaeda operatives. I met a man named Abu Basir near the mountains of Asadabad. He told me that several Arab fighters of Al Qaeda had been asked by their leaders to reach Iraq. These fighters have been slipping into Pakistan from different points in eastern Afghanistan and Al Qaeda's network in Pakistan is arranging their safe onward journey to Iraq through Iran on fake passports. The Pakistani authorities have arrested two officials of the country's passport agency in Peshawar for allegedly providing fake passports to these Al Qaeda operators. Further investigations revealed that Al Qaeda leader Saif al-Adil and Yazz bin Sifat had slipped into Iran from the Afghan town of Taftan. Both are wanted in connection with the September 11 attacks. Taftan is in the southwestern part of Afghanistan. The Herat province in western Afghanistan is governed by the pro-Iran warlord Haji Ismail Khan. The US ambassador to Afghanistan, Zalmay Khalilzad, confirmed to some journalists in Kabul recently that he had evidence of Iranian interference in western Afghanistan. Yusuf Pashtun, spokesman for a pro-Karzai warlord in southern Afghanistan, has claimed many times that Iranian agents have been smuggling arms into the southern Helmand province and that Iranians are providing training to the troops of Haji Ismail Khan. Haji Ismail received thousands of Iranian AK-74 automatic rifles produced at a Russian-built factory outside Tehran. Sources close to Afghanistan President Hamid Karzai claimed that some Iran Army officers are part of the Haji's powerful 20,000 strong militia. Sources claimed that one of his military advisers is General Ali Blokian, a former adviser of Hizbullah in Lebanon and actually an officer of Iranian military intelligence. Ismail Khan is a threat to President Karzai's authority. He has objected to the deployment of coalition troops in his province. Now, he is encouraging the remnants of the Taliban to attack coalition forces in southern Afghanistan under instructions from Tehran. Cofer Black, the US state department's counter-terrorism chief, confirmed to me recently that they have evidence of the collaboration between Al Qaeda and Iran. Some defectors from Iranian intelligence have provided a lot of information to the American authorities. According to this information, the Iranian Pasdaran (Revolutionary Guards) are in regular contact with Al Qaeda. The Pasdaran are not under President Khatami's control. They report directly to Ayatollah Khamenei, Iran's supreme leader. Iran's Minister for Intelligence Ali Fallahian and Quds Force chief Ahmad Vahidi are also said to be in contact with Dr Ayman al-Zawahiri. According to very reliable sources, Zawahiri was arrested by mistake in Iran in 2002. News of his arrest was published in a newspaper called Hayat-e-Nau (or New Life), but the very next day the report was contradicted by Iran's foreign ministry. It is believed that Zawahiri was released on Ali Fallahian's order. The big question is: why are the Iranians playing a double game with the Americans in Iraq and Afghanistan? The answer is simple: The Iranians want to convert Iraq into another Shia state because Shias are the majority in Iraq. Secondly, they want control over Iraq's oil to give a boost to their deteriorating economy. But the US will not allow Iran to establish a pro-Tehran Shia state in Iraq and the Iranians believe that the American military presence in Iraq and Afghanistan is a grave threat to their agenda. The Iranians also want control in Afghanistan for economic and political reasons. Afghanistan is the gateway to the Central Asian states, which are rich in natural resources. Tehran wants to capture that gateway to establish an indirect monopoly on the oil and gas reserves of Central Asia. Third, the Iranians want American forces expelled from the Middle East. This is Al Qaeda's aim as well. The Iranians have established the 'Quds Force' for the liberation of Al Quds, or Jerusalem. Al Qaeda has the same objective. For achieving these common goals, the Iranians and Al Qaeda are cooperating with each other. Many people in Kabul these days openly blame the pro-Iranian warlords in western and northern Afghanistan, who are trying their best to delay the elections planned for September this year. Diplomatic circles in Kabul fear a possible increase in attacks on the coalition forces. These sources are sure that Al Qaeda is planning a big, deadly attack inside Kabul with Iran's help. Both hate President Karzai whom they see as a great hurdle for their agenda in the region. It is also important that some fighters of Gulbuddin Hekmatyar have been arrested from Kabul. They were planning bomb blasts in the capital. Hekmatyar left Tehran after September 11, 2001, but his close association with Iran and Al Qaeda is not a secret. Many people in Kabul believe Hekmatyar will play an important role in the expected deadly attacks against coalition forces in the days to come. The CIA got evidence of Iran's links with Al Qaeda in the spring of 2002, but CIA Director George Tenet remained silent on the issue. He was then more interested in establishing a link between Al Qaeda and Iraq, but he eventually failed to establish that link and had to quit. Many people believe Tenet did a great job for the Islamic militants under the leadership of George W Bush. The militants were divided on sectarian lines for more than 1,400 years. But for the first time bad American policies and weak intelligence have resulted in a deadly alliance between Shia and Sunni militants in Iraq. The American media claimed that Al Qaeda was responsible for a car bomb attack on August 7, 2003, in Najaf in which Iraqi Shia leader Ayatollah Baqir el-Hakim was killed along with 82 other people. For many days there was confusion about who was responsible for that attack. Finally the government-run Tehran Times rescued Al Qaeda on September 9, 2003, with a front-page story in which it blamed the Israeli intelligence agency Mossad. The paper claimed that the explosives used in the attack were smuggled from Israel to Iraq by Mossad agents. Hizbullah leader Hassan Nasrallah also blamed Israel while addressing a gathering in Beirut. Now Shias and Sunnis are offering prayers in each other's mosques. The Iranians are encouraging that kind of unity in Afghanistan and Pakistan. Recently they invited some pro-Taliban leaders from Pakistan to Tehran. Prominent among them were Maulana Sami-ul Haq and Fazalur Rehman, who have both openly opposed the war on terror in Afghanistan. They met important Iranian leaders. After their return from Tehran, Maulana Sami-ul Haq organised a seminar in Islamabad in the last week of May. This religious leader had close links with hardline anti-Iran Sunni extremists, but he invited not only some Shia leaders but also some Iranian diplomats to the seminar where he appealed to all Shia and Sunni leaders to emulate the Shia-Sunni unity in Iraq. The participants in the seminar adopted resolutions against US operations in Iraq and Afghanistan and condemned the operation against Al Qaeda by Pakistani forces in the tribal areas bordering Afghanistan. 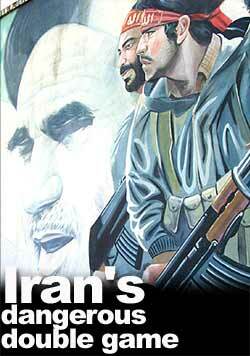 The Americans now know more about Iran's links with Al Qaeda than Saddam's. So why aren't they making more of a fuss about it? Simple: because they have lost credibility. Al Qaeda lost Afghanistan in 2001, but they are regaining their power from Iran in 2004. The Iranians have removed their enemy, the Taliban, from Kabul using the Americans. Then they removed another enemy, Saddam Hussein, from Iraq, again using the Americans through Ahmad Chalabi. Now they are using Al Qaeda in Afghanistan and Iraq against the Americans. It is the Iranians who are the real winners of the wars in Afghanistan and Iraq, not America. Hamid Mir, the well-known Pakistani journalist and rediff.com contributor, has interviewed Osama bin Laden, US Secretary of State Colin Powell, and General Richard B Myers, then chairman of the US Joint Chiefs of Staff, after 9/11. He travelled through Afghanistan, Iraq and Iran recently. He is currently working for Pakistan's Geo TV network and is also writing bin Laden's biography.